If you have a busy life and no time to cook during the week, organise yourself, eat well and save money…Here’s how! Do you have a busy life? Do you feel overwhelmed by the lack of ME time? It’s not easy to accomplish everything we wish to in 24 hours. To be able to manage work, exercise, good sleep, family and social life, errands, house chores, hobbies, a well-balanced diet and so forth, we need to organise our lives and be time efficient. In some cultures, lunch is enjoyed with family, friends or colleagues on a daily basis. It’s a long meal which might be followed by a ‘siesta’ before continuing with afternoon and evening activities. However, not everybody is that lucky. In busy cities, lunch is the meal that most people eat by themselves, whether at home, in the office, in a park, or on the go. Takeaway food has therefore, become very popular and varied. Making a quick salad with your favourite ingredients is absolutely possible even for the busiest among you. 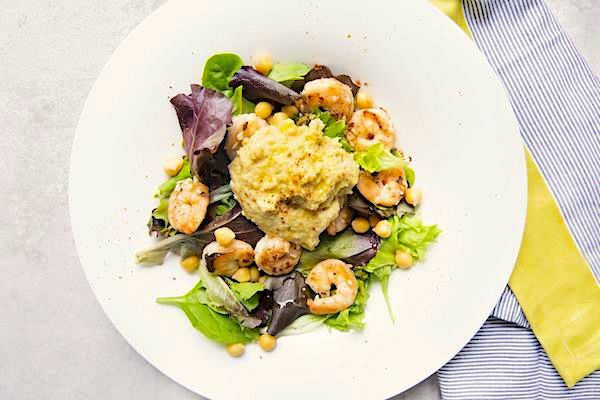 Whether you bring lunch to the office and eat at your desk, or make a stop home for a quick lunch between appointments and errands, or whatever your lifestyle dictates, a salad will always be a good guilt-free option for lunch. Here are some tips on how to organise yourself for a week of great, guilt-free and easy-to-make salads in no time. Green salad – choose a nice and colourful combination of fresh leaves. If you have easy access to a farmer’s market get fresh salad for the week. Rinse it three times, dry it and put it in a container with paper towel underneath and on top. It keeps well in the fridge. Every now and then sprinkle some water on the paper towel to keep it fresh. Salad bags are an easier option because usually they don’t need to be washed and you can keep them in their bag in the fridge. Avocados are always good to have on hand. They are delicious, a good source of natural fat, and filling. Half an avocado is a good serving for one. Keep the other half with the seed and wrap it in plastic film, keep in the fridge. 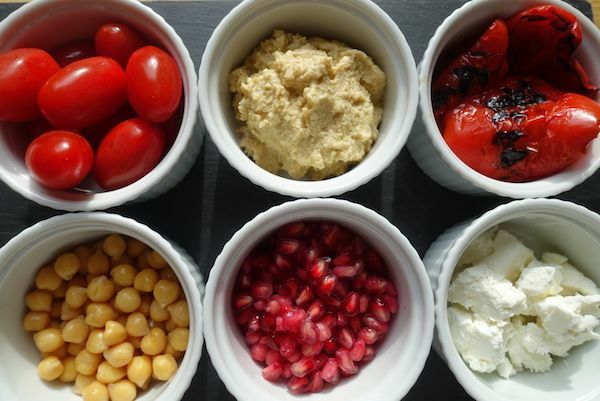 Homemade hummus is healthy, delicious, inexpensive and filling. It goes very well in a salad. I’ve tried several recipes and my favourite is the one from Chocolate & Zucchini (C&Z). Adding kombu seaweed when cooking the chickpeas is a really good tip that makes the hummus easy to digest. The flavour deepens as the days go by. If you make hummus, keep some chickpeas to add to salads. They give great texture and a light flavour. Grilled vegetables are delicious and colourful. I like to grill red bell peppers, courgettes and aubergines. Hard boiled eggs are a good snack or salad ingredient. When the water comes to a boil, add the eggs and boil them for eight minutes. Then transfer to a bowl with iced water to stop cooking. The yolk will be hard on the outside and soft on the inside but not runny. If you have access to a microwave oven, a good idea is to cook courgettes and add them to your salad. Cut a courgette in four lengthwise and in half. Place the pieces on a plate with water (1/2 cm high should do) and season with salt and pepper. Cook in the microwave oven for two minutes. Remove carefully because the water will be very hot. The courgettes will be soft and ready to be tossed to your salad. 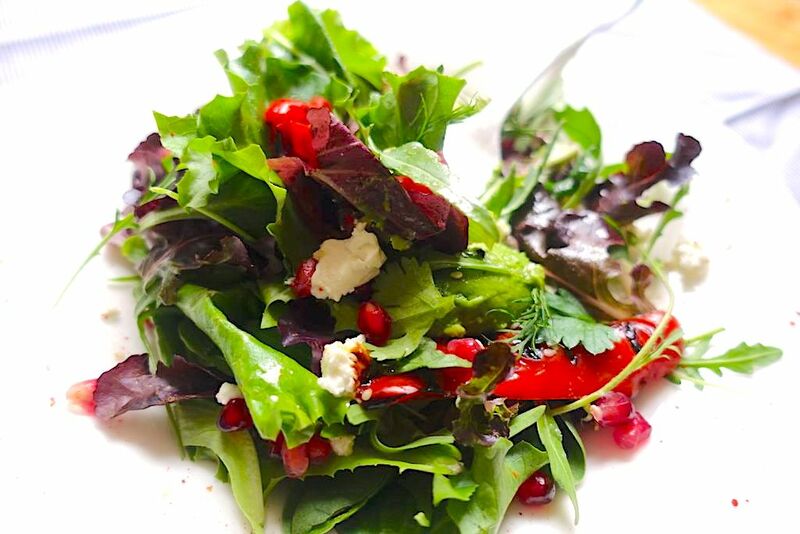 An aromatic fine herb salad is great to have in your fridge. It highlights not only salads but many other dishes. You’ll need flat parsley, coriander, dill, chives and chervil. Rinse and dry them, remove the leaves from the stems. Chop the chives three centimetres long. Mix the herbs and store in a container with paper towel underneath and on top. Pomegranate seeds are colourful, crunchy, delicious and full of vitamin C and antioxidants. If you can, buy the fruit and remove the seeds yourself. They will last much longer than if you buy only the seeds. Feta cheese is another favourite. It goes very well in salads and omelettes. Grilled shrimp is always a winner by itself, with avocado, in salads, etc. It takes only a couple of minutes to prepare on a grill or in a pan. Smoked salmon will add good fat, a lot of flavour and colour. Cooked beetroot is soft, colourful and has a light earthy taste. Cherry tomatoes are very easy to add, either whole to have an explosion of freshness in your mouth or cut in half. A handful is perfect to add to any salad. Rinse before eating. With so many delicious ingredients to make a delicious salad, I hardly ever bother to make a vinaigrette. A good quality extra virgin olive oil, some reduced balsamic vinegar or glaze, and sometimes sesame seeds are more than enough to highlight the flavours. Make the prep work sometime during the weekend and get creative during the week with very little effort. If you happen to make a BBQ, take advantage of the grill and do some prepping surrounded by friends. I would love to hear your thoughts, creations and any favourite ingredient not listed. Enjoy! You might be interested to read the Black quinoa salad recipe.